Tarek Chemaly: M2 Multimedia Megastore - independence, not Black Friday, sale. M2 Multimedia Megastore - independence, not Black Friday, sale. Well now this is a lovely ad: "Keep black Friday to whom it belongs". 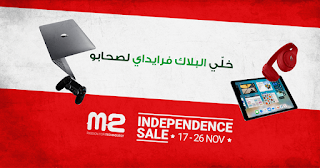 Obviously with "black Friday" (minus the Thanksgiving) hitting Lebanon yearly, M2 Multimedia Megastore has had enough of it and wants everyone to knnow they are organizing an independence day sale (which falls on Nov. 22nd). Honestly, with us bastardizing events from other places I can totally relate!